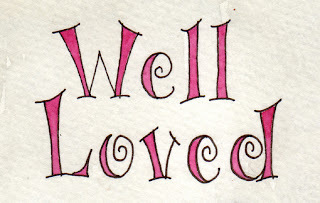 My niece Karli is such a sweetie-pie. From the time she was a baby, she's been loved by everyone who knows her. She's kind, compassionate, funny, and one of the best people I know. Next year, she'll be heading off to college, and I'm really going to miss her. We've always been close, and I wanted to do something special for her before she leaves the nest. Her mom was telling me one day about how Karli's bed is always piled high with blankets, because she likes to snuggle under all the cuddly quilts and throws that have been given to her over the years by people who care about her. 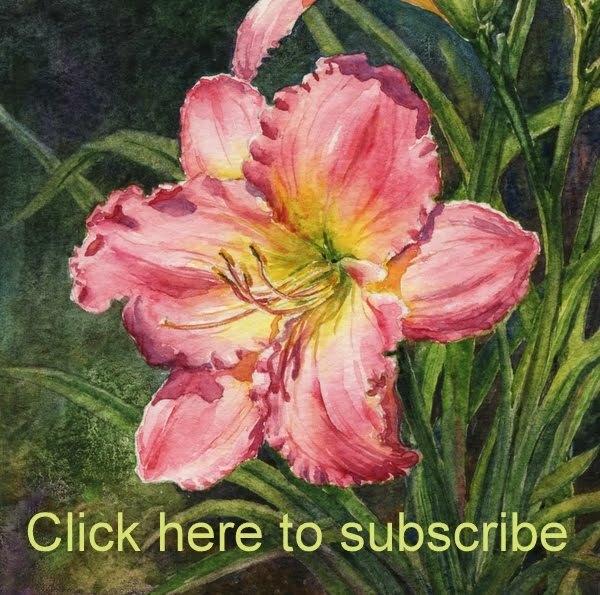 That gave me the idea for a special painting, one that would show all the things that have surrounded her with love through all of her 18 years. My husband joked when he saw it, that it looks like a "Where's Waldo?" painting, and I have to agree it's busy, busy, busy! But I love it that way. It's full of life. 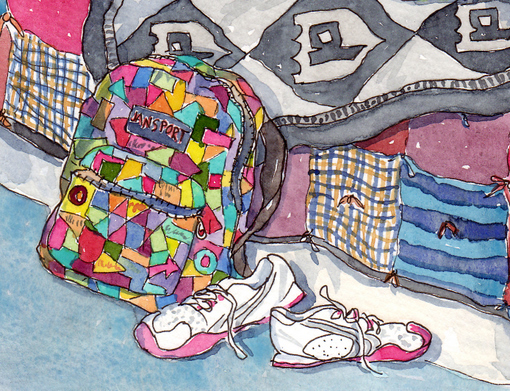 There's her crazy backpack, hand-colored and signed by all her friends, and next to it, her favorite pair of running shoes. She runs cross-country at Preston High, so I had to include those. Grandma Saundra made her the black and grey quilt with the Preston Knights logo on it, and Grandma Vi, who passed away two years ago, made her the simple tied patchwork comforter underneath it. 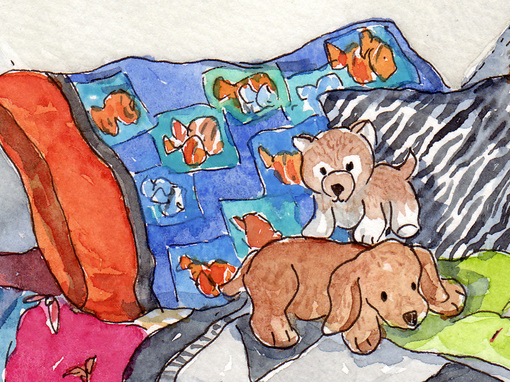 Aunt Michele made her the "Finding Nemo" pillowcase years ago, and it's been on her pillow ever since then, with only the necessary breaks for laundering. Karli bought the little wolf stuffed animal when we went to a wolf sanctuary last summer in Colorado. The limp, floppy, old brown dog toy has been with her almost every night of her 18 years and will most likely accompany her to college. The zebra print pillow was a project she worked on here with me one weekend. 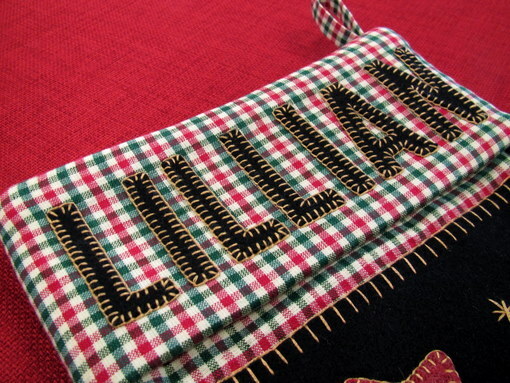 The bright green blanket was embroidered by a family friend who's known her since she was a baby. 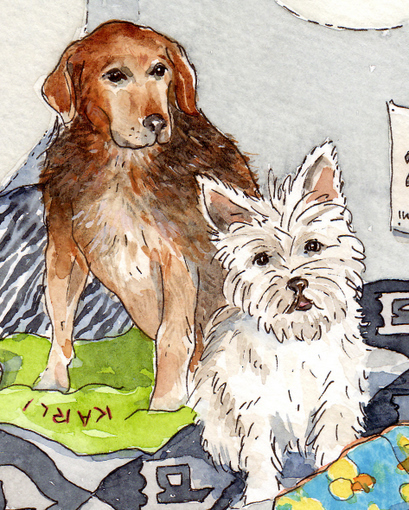 Her three dogs have been a huge part of Karli's life. Rudy the beagle is 14 years old now and his arthritis has slowed him down in recent years, but he's still as sweet as ever, with his placid disposition and gentle ways. 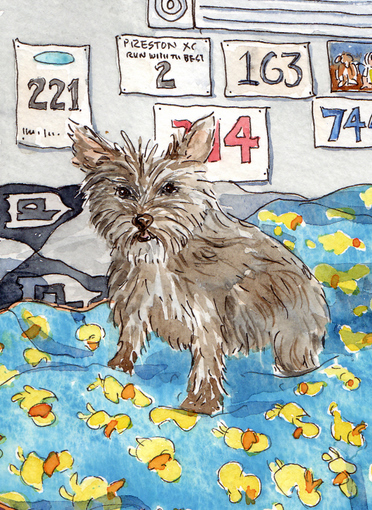 Brewster, the baby of the bunch, is a bouncy Cairn Terrier who never runs out of energy. Kayli is Brewster's mama and is a bit feistier than her son. There's a lot of dog packed into that little package! The yellow duckie polar fleece throw was one that I made for Karli when she was little. She's been snuggling under it for fifteen years. The numbers on the wall are reminders of all the cross-country races she's participated in. 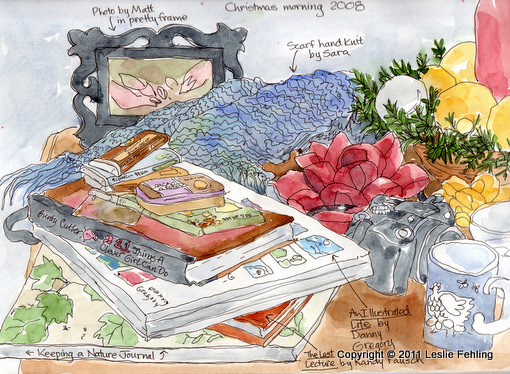 Christmas morning sketch, 9" x 12"
May your Christmas morning be filled with all the joy your heart can hold! Christmas is only three days away, and I'm finishing up some last-minute projects, like these cute embroidered wool Christmas ornaments. Since I'm a grandmother now (and a crafty one at that!) I've decided to start a new tradition of making a handmade ornament for the grandkids each year. Since we only have two grandchildren so far, it's pretty easy! Lilly and Nicholas each got new Christmas stockings this year to match the rest of the family's, so I thought it would be fun to make stocking ornaments, too. 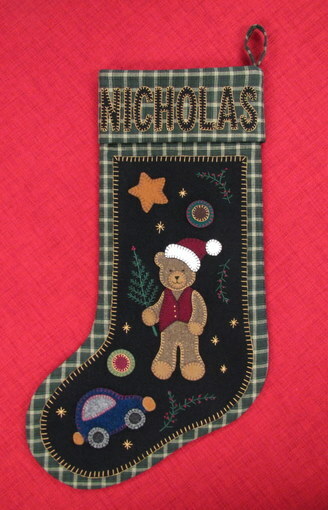 Wool ornament, 3-1/2" x 4-1/2"
Nicholas' stocking has snowflakes embroidered on hand-dyed blue wool. For each snowflake, I drew three criss-crossing lines with a chalk marker, to give me a hexagon shape, then just started adding French knots and crossing lines. They're not perfect, but I wasn't too concerned about it. It just makes them look handmade, right? Lilly's sweet little pink wool Christmas stocking ornament has embroidered daisies, done with a lazy daisy stitch, surrounded by French knots. It looks like daisies in the snow, doesn't it? I added a monogram to the front side of each cuff and embroidered the date on the back. I love knowing that, years from now, when 2011 is just a distant memory, Lilly and Nicholas will be hanging these ornaments on a Christmas tree and remembering their Grandma Leslie. 2 - Cut out the drawing to make a pattern for the stocking. The cuff can simply be measured and marked on the wool. 3 - Trace the pattern onto the wool, but don't cut out the individual pieces yet. If you leave them as a larger piece, it's easier to handle them while embroidering. 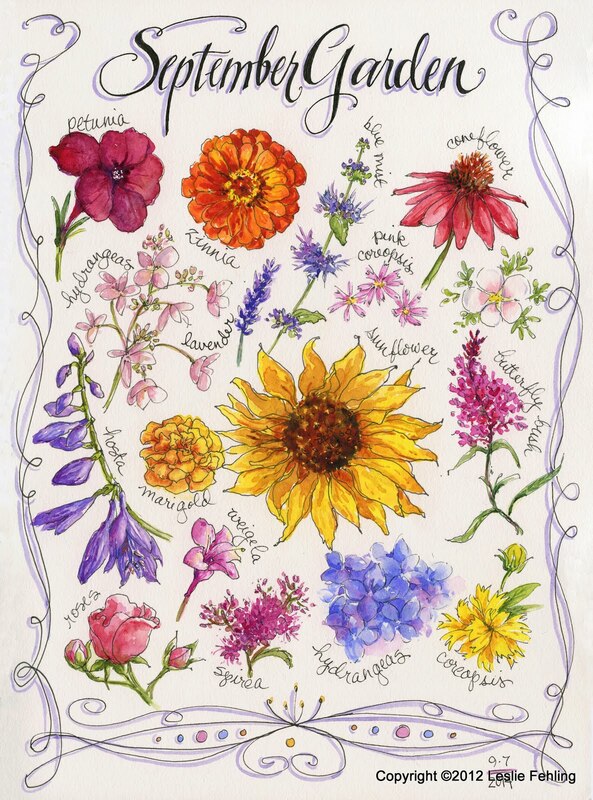 4 - With a chalk marker or disappearing marker, draw on the flowers, snowflakes, monograms, and dates. 5 - Embroider the designs using 2-3 strands of DMC floss. 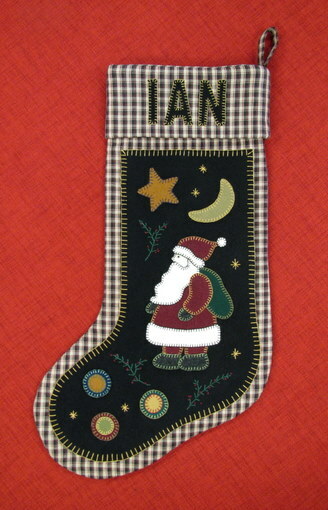 6 - Cut out each stocking and cuff. 7 - Using fabric glue, lightly glue the edges of the stocking front and back together around the edges, leaving the top open. Don't use too much glue, just enough to anchor the pieces together. 8 - Glue the cuff pieces onto the front and back of the stocking. 9 - Embroider the blanket stitching on the bottom edge of the cuff, front and back. 10 - Stuff the stocking lightly with polyfill. 11 - Make a hanger by cutting three pieces of 6-ply embroidery floss and braiding it together. 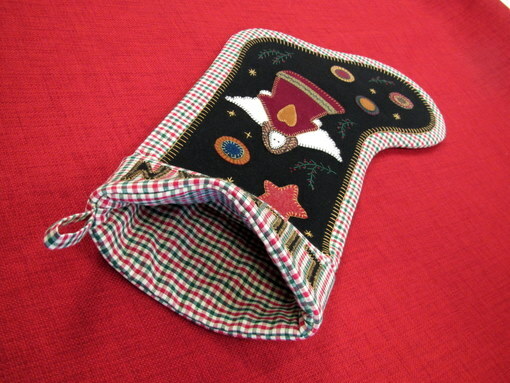 Knot the ends and glue it in place inside the cuff of the stocking. 12 - Lightly glue the top edge of the front cuff to the back cuff. 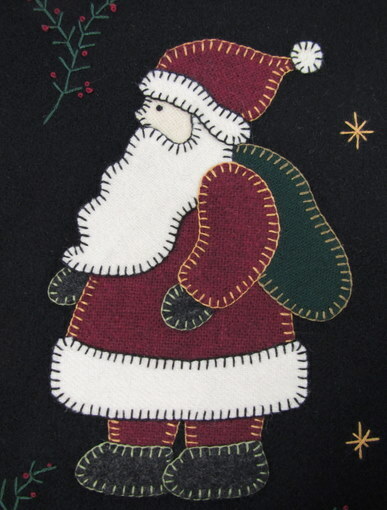 13 - Blanket stitch around all the edges with 3 strands of embroidery floss. Our family is growing! 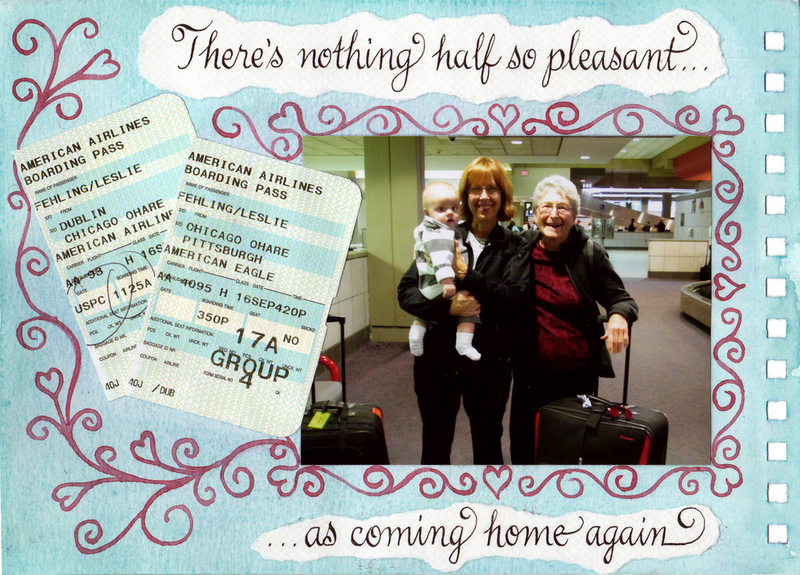 In the past year and half, we've welcomed a new son-in-law and, not one, but two new grandchildren into our family. Hand-embroidery outlines each appliqued wool piece. 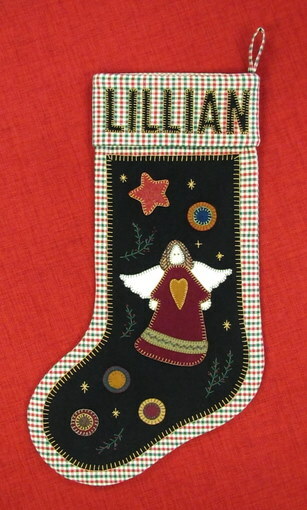 Five-year-old Lilly's stocking is made of cheery red and green gingham with a pretty angel in the center, surrounded by stars, branches, and wool "pennies." 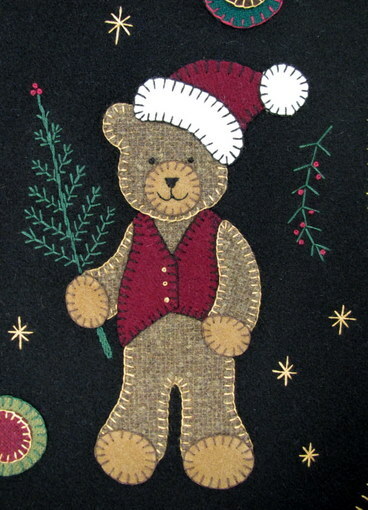 All of the stockings are fully lined and interlined. 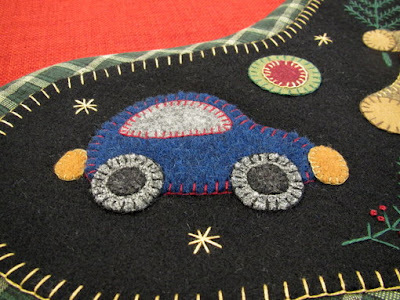 The wool applique pieces were fused in place, then edged with buttonhole stitching done with two strands of DMC embroidery floss. 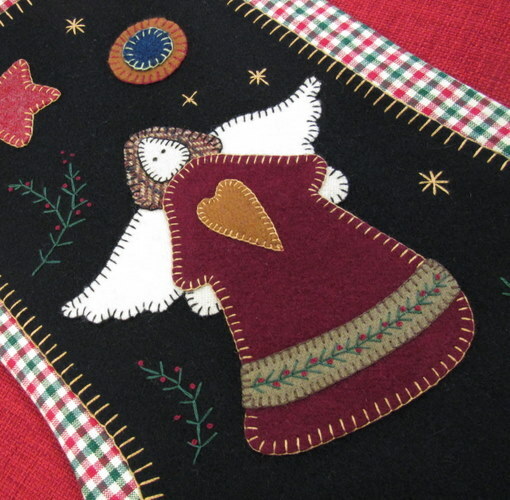 The angel's skirt was given a little something extra, a decorative band of feather-stitching with French knots. Now we're just waiting to see what Santa brings to fill our stockings - only a week to go! 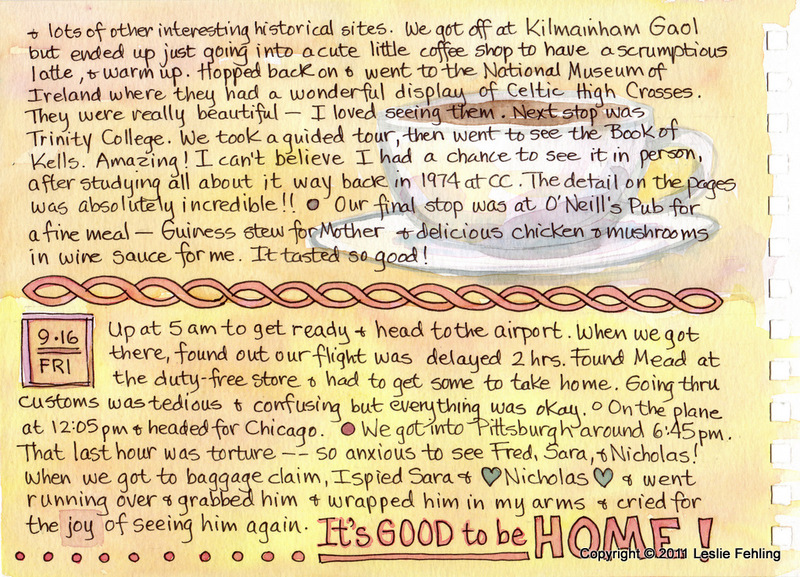 With only three days left until we had to fly back to the US, our wonderful Irish adventure was coming to a close. 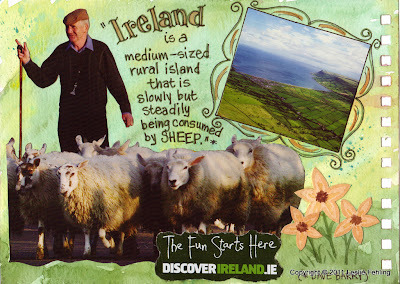 As we left the west coast and pointed our car toward Dublin, I was feeling a little worn out and ready to head home. Two weeks is a long time to be on the road, and I missed my little grandson Nicholas so badly! I really couldn't wait to hold that baby again. 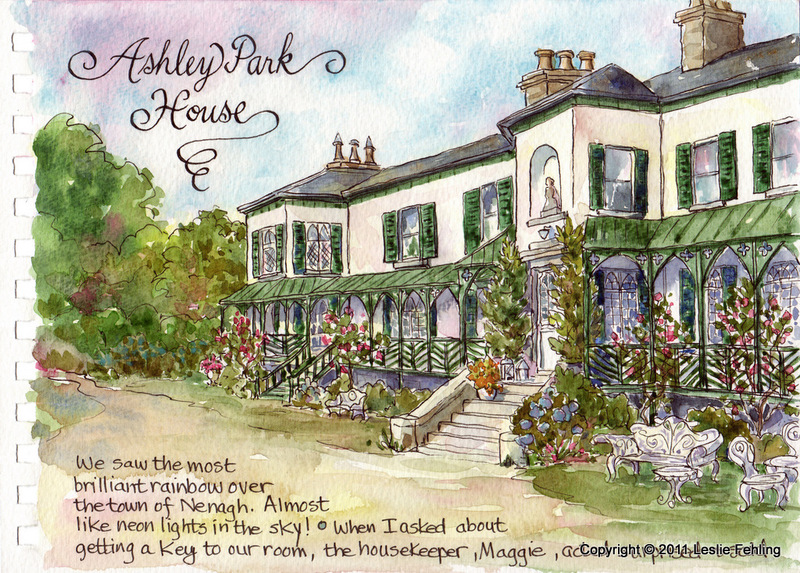 Watercolor, pen & ink, 7" x 10"
One night, we stayed in a quirky old inn near Nenagh, in County Tipperary. It was surrounded by park-like grounds with meandering trails that we could stroll around on to explore the area. There was a lake with flocks of swans and ducks, a pasture with grazing horses, and some deep, dark woods with huge old trees. It was so idyllic! I was wandering around by myself the morning we were going to leave and came upon a Victorian walled garden, hidden between the woods and the barnyard of the old manor house. It was so cool! I felt as if I had stepped into the pages of The Secret Garden. 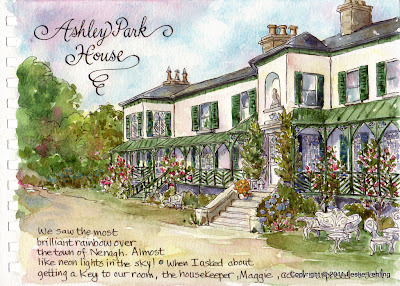 Before we packed up and headed for the city, I took some time to do this sketch of the house. 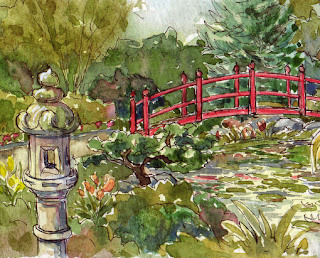 It was so nice sitting there drawing, just enjoying the peace and quiet of that pretty, secluded place. 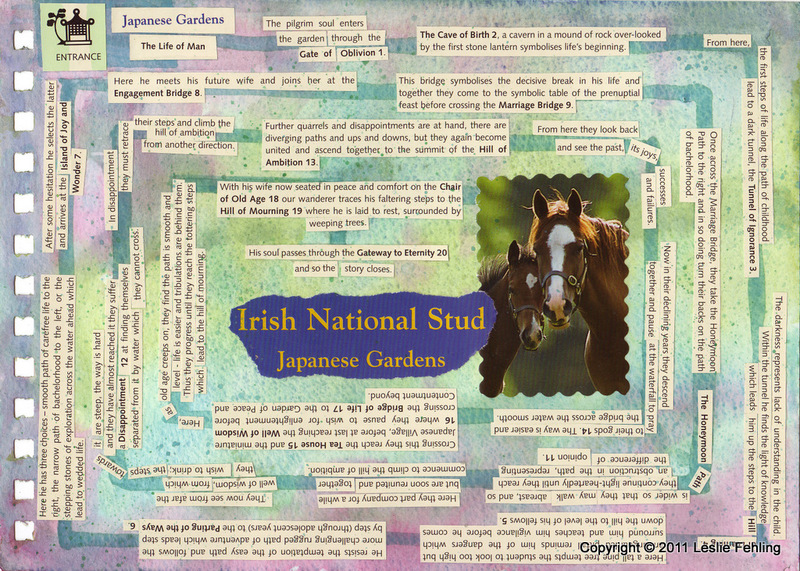 On our way to Dublin we stopped at the Irish National Stud and Japanese Gardens in Kildare. 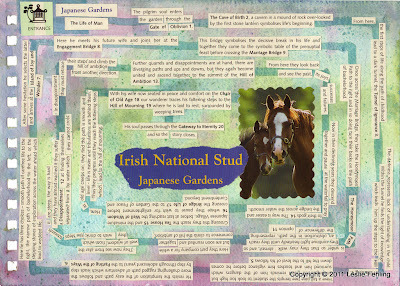 The National Stud is the Irish national horse farm where generations of champion thoroughbreds have been raised. On the grounds of the farm are the beautiful Japanese Gardens, created in 1906 and recognized as some of the finest in Europe. 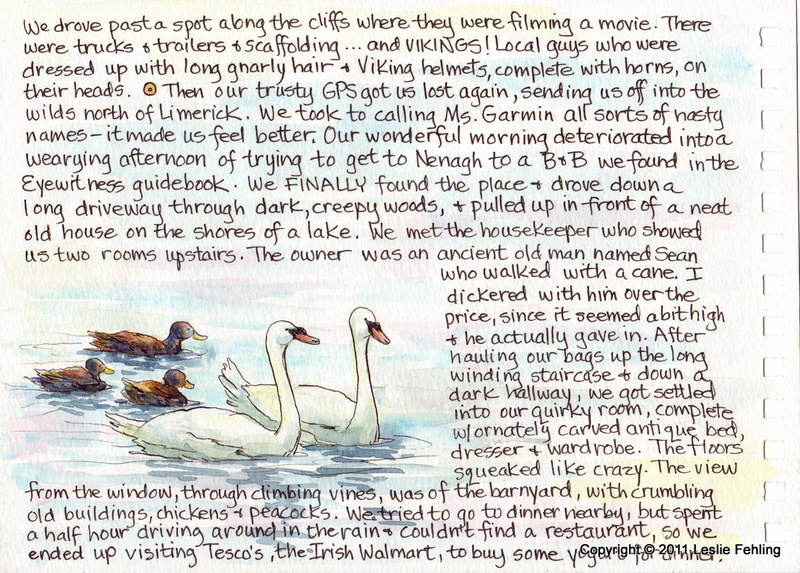 Not exactly what I expected to find in Ireland, but a pleasant surprise that I really enjoyed. 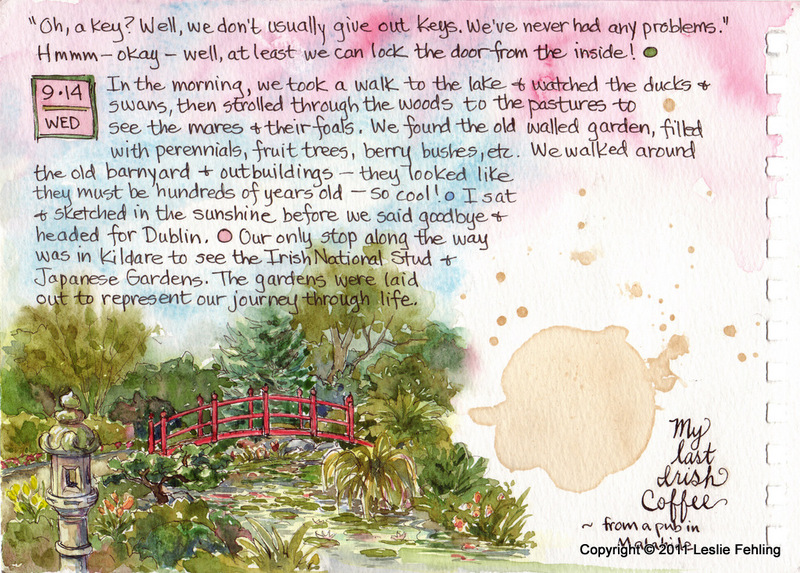 Watercolor, pen & ink, (and coffee), 7" x 10"
Walking through the gardens, we followed a path which traced the journey of man from birth through death and afterlife. I thought it was so interesting, and profound in a lot of ways. I loved the part where the man gets married, and the path widens, "so that two may walk abreast." Then comes the "Difference of Opinion", where the husband and wife take their own separate paths for awhile, eventually reuniting after going through some rough places. I wanted to remember our walk through "The Life of Man," so I cut up the brochure that told the whole story and glued all the little pieces of text onto a collage page, with the story spiraling around on a path to the center. 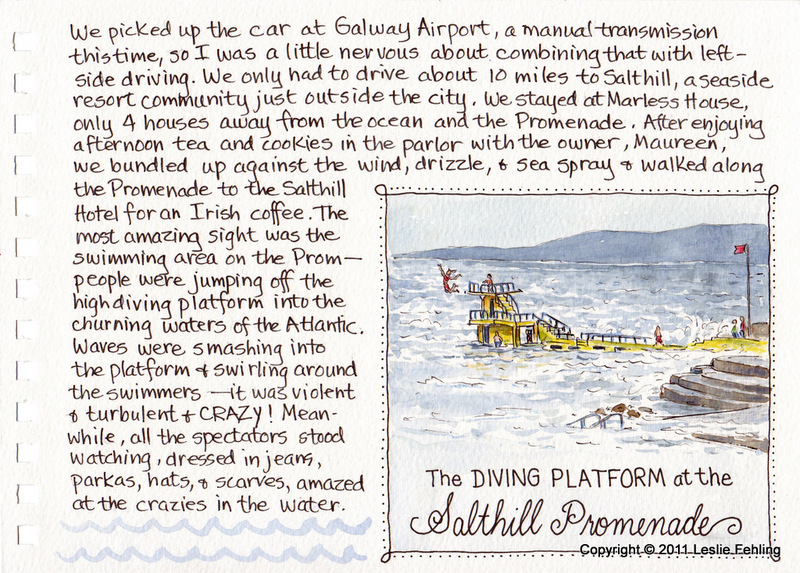 It's not a particularly successful sketchbook page, but at least I have a record of a place that I really enjoyed. 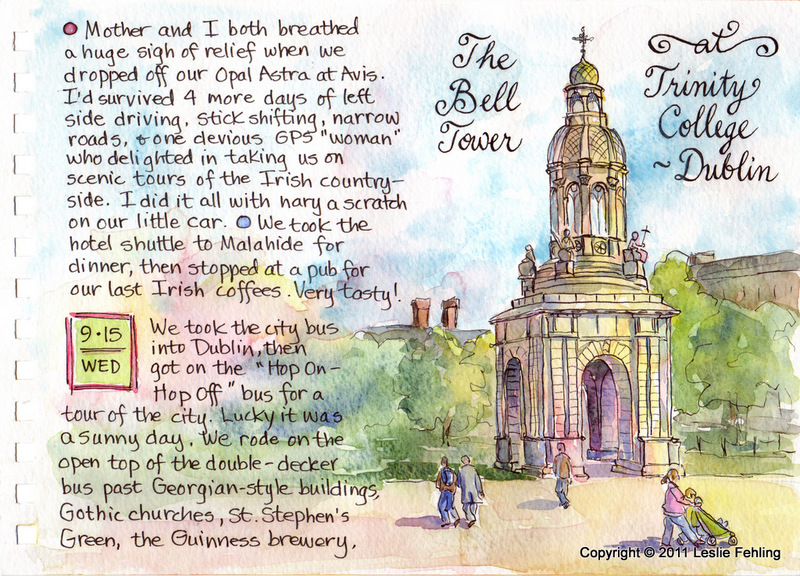 Our last day in Ireland was spent touring Dublin, so I dedicated a few pages to some of the things we saw there. We took the Hop-On Hop-Off bus tour, which was a fun, stress-free way to get around the city and learn about its history. 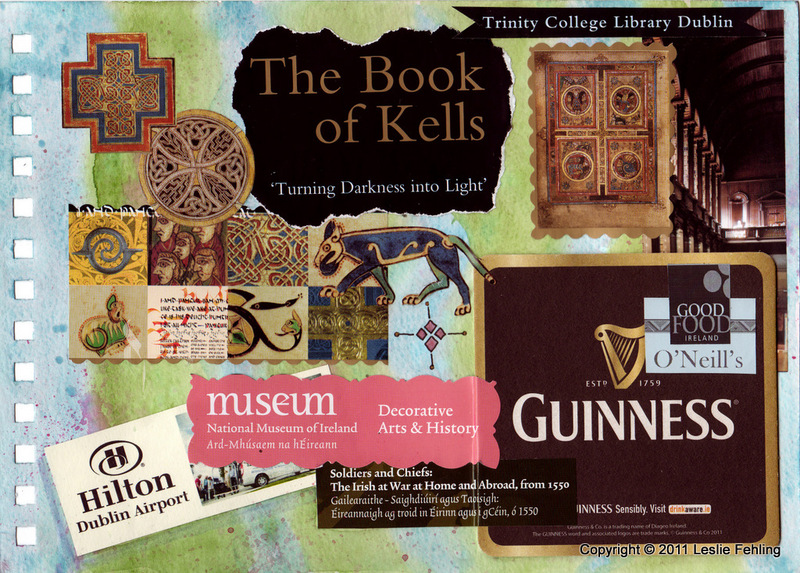 Collage, watercolor, 7" x 10"
Trinity College was an interesting stop. We took a guided tour, and, at the end, I had a little time to sit on the steps of the dining hall and draw the famous Bell Tower. Later, when I painted it at home, I decided to liven up the gray stone structure with the glow of late afternoon sunshine that had warmed me while I sat and sketched. The main reason I had wanted to visit the college was to see the famous Book of Kells that's on display there. I think it was worth the trip to Ireland just for that! I like this cappuccino background painting that I did on the final text page of my journal. Doesn't it feel warm and cozy? 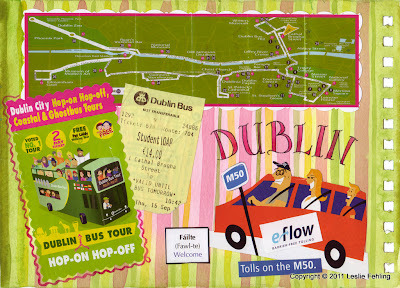 I took way too many art supplies with me when I went to Ireland, just like I do for every trip. I always have such high hopes of all that I'll accomplish: "Oooh, I might want to try out those colored pencils! 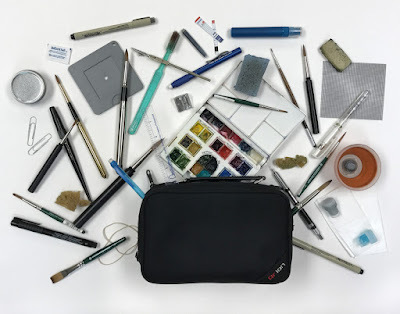 And I just might need that spatter screen and all those drawing pencils in various hardnesses. And I'm sure I'll use that set of markers." Then reality hits when I'm in the midst of my vacation and for days I haven't had time to do anything more than jot down a quick pencil sketch. So, I thought I'd show you what I actually used when I was on location in Ireland. 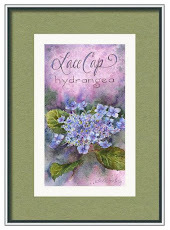 I took a watercolor set with 18 pans of color which I had filled with Winsor & Newton and American Journey watercolor paints. I like having a decent sized mixing area and a nice selection of colors to work with, so this size works well for me. 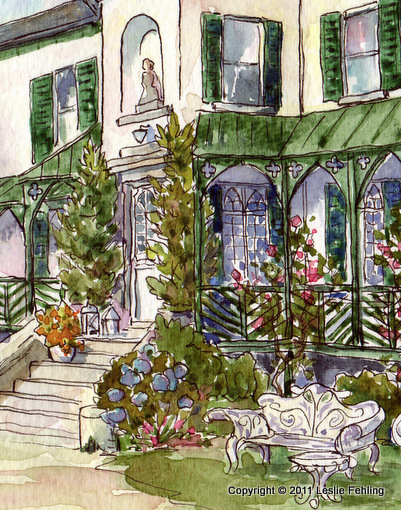 I usually sketched with either a mechanical pencil, or a Faber-Castell Pitt Artist's Pen with Superfine nib. Often, I did a preliminary pencil sketch to make sure my proportions and perspective were okay, then inked the lines with my Noodler's Flex Nib Fountain Pen and added some details. I always carry a kneaded eraser or two, plus a stick eraser. I took several regular paint brushes along and used a few of them, but mostly I just pulled out the water brush you see in the picture above. Now that I know that I can get by with just the basics, I wonder if I'll be able to control myself when I'm packing for my next trip. Hmmm, probably not. I mentioned Kylemore Abbey in yesterday's post. While we were there, I picked up a few fall leaves and pressed them in a guidebook we had along, so I could use them later in this collage. 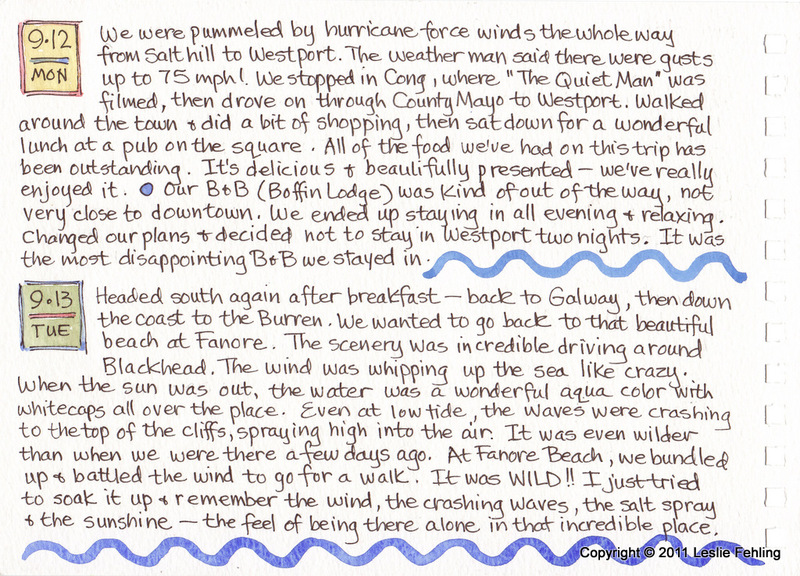 Our traveling companions added so much to our enjoyment of our week-long tour with Driftwood Tours. All four of us kept saying over and over how thankful we were that we all liked each other. 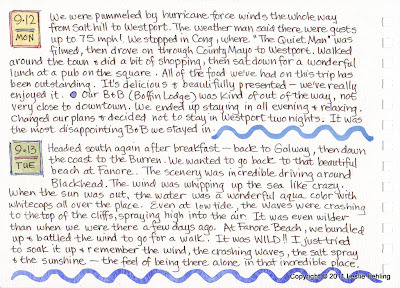 We can't imagine how the trip could have been any better. 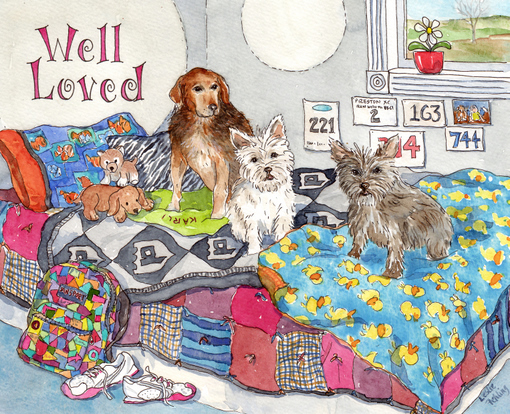 Collage, watercolor, marker, 7" x 10"
After saying goodbye to our friends, we were on our own again. 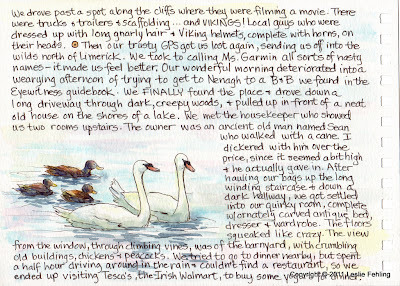 We stayed near Galway that evening and got a kick out of people-watching as we walked along the Promenade. 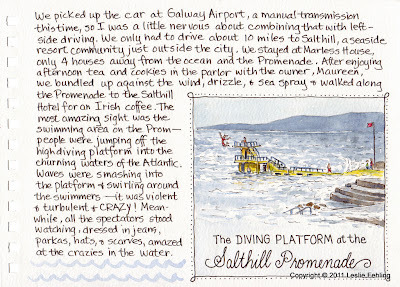 Because a hurricane was on its way, the winds were fierce, and some good-sized swells were crashing into the old diving platform at Salthill. 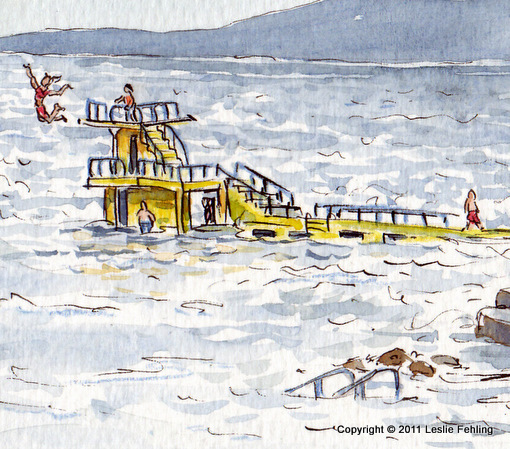 It was half submerged, but people were still jumping off of it into the turbulent waters of Galway Bay. 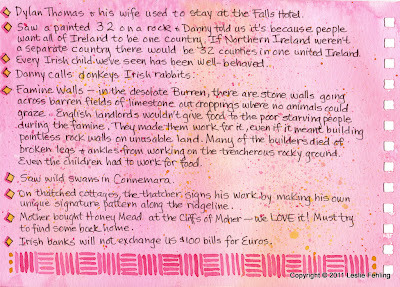 Those Irish are hardy souls! 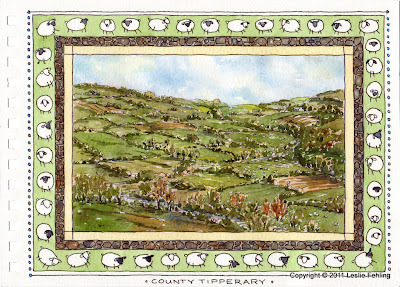 Heading east toward Dublin from the west coast, we drove through County Tipperary. 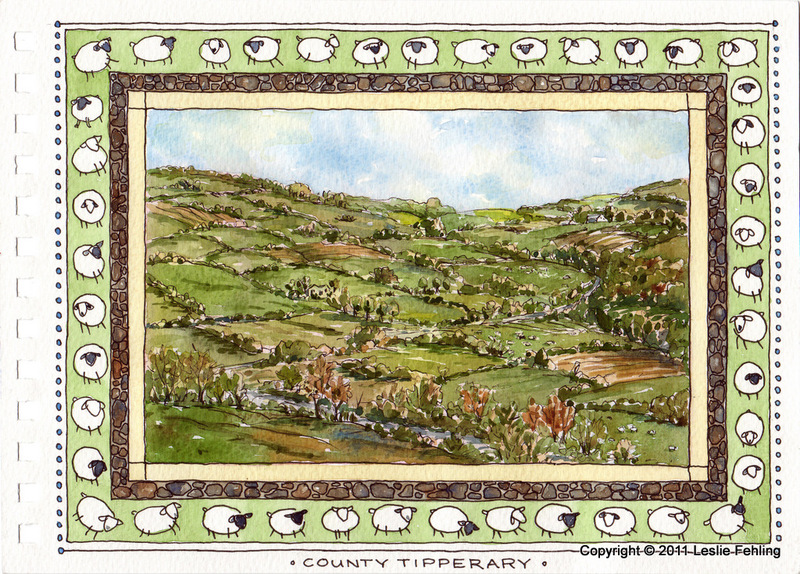 I wanted to paint one final picture of the gorgeous green fields before we returned to the city, so I sketched this one. 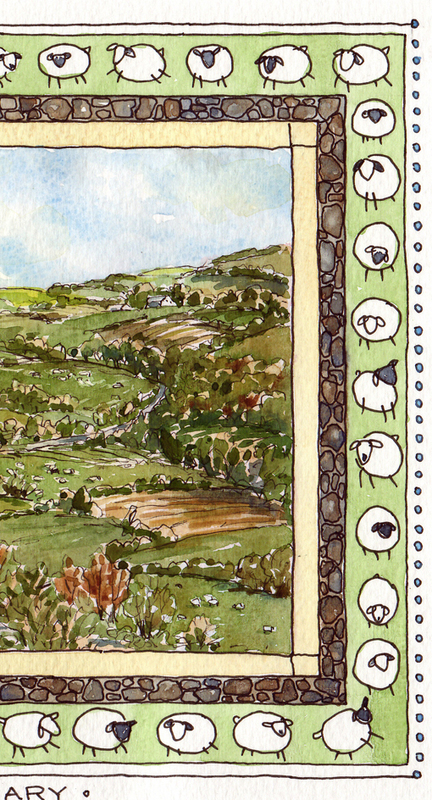 I thought it would be fun to surround the sketch with a border of frolicking sheep and an Irish stone wall. Only one more day to go, then it's back home again! 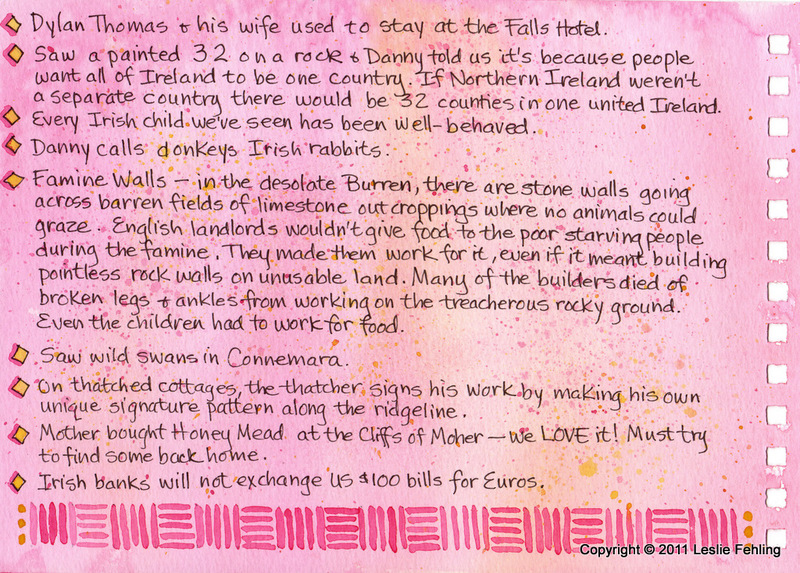 This next page was a bit of a catch-all, where I wrote down an assortment of interesting observations and facts that didn't really fit in anywhere else. I just added to it day by day when there was something I wanted to remember. Since I was working on both sides of the paper in my sketchbook, I tried to coordinate the colors of pages that were facing each other, like the ones shown above and below. 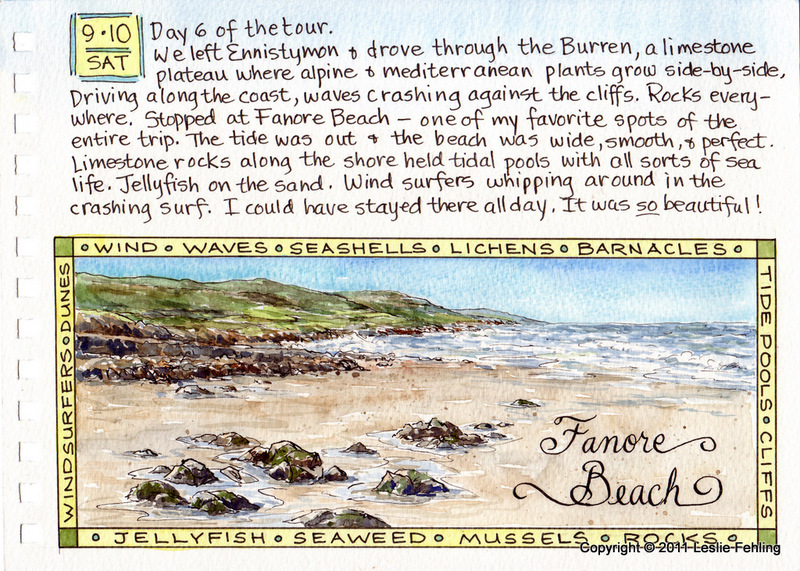 Collage, marker, watercolor, 7" x 10"
We visited many of the famous sites in Ireland, the ones that top every tourist's list of must-see places, and I wouldn't have wanted to miss any of them, but the place I loved the most was Fanore Beach in County Clare. It was just by chance that we pulled in there for a rest stop at the public facilities (which were few and far between!) I couldn't resist checking out the beach, just over the hill. Wow! 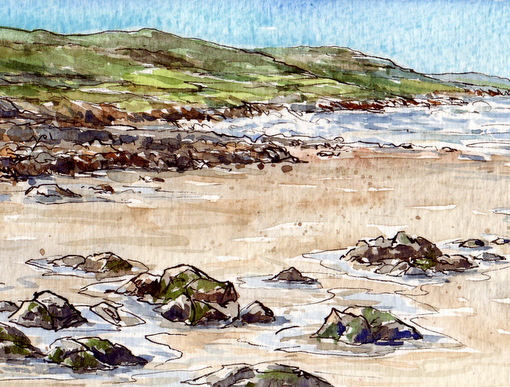 It was a beautiful, wide expanse of sandy beach edged with limestone outcroppings leading up to high sand dunes. The sun sparkled on the water and a brisk wind was blowing in off the sea. Waves were crashing on the shore and up against the cliffs in the distance. 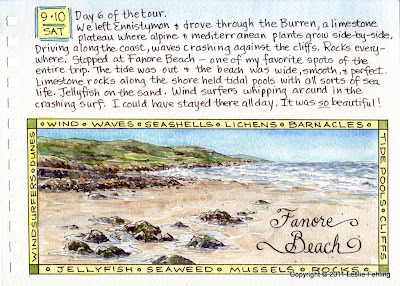 There was just something about Fanore Beach that spoke to me - the wild beauty of it all. 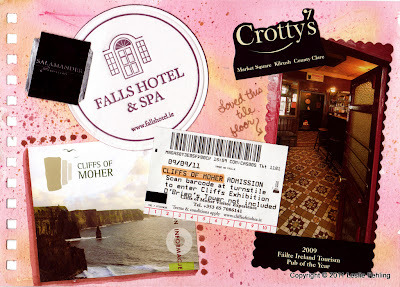 I felt a connection to that place, and it was so hard to tear myself away and head to the next stop on our trip. I vow to go back someday and stay in a little cottage just over the hill. Then I can walk those shores to my heart's content. 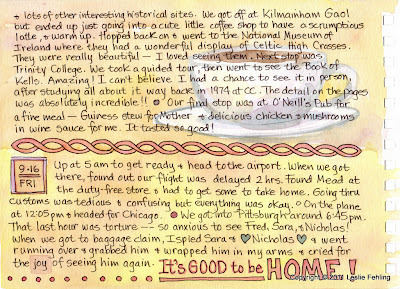 The page above commemorates a funny moment during our trip. 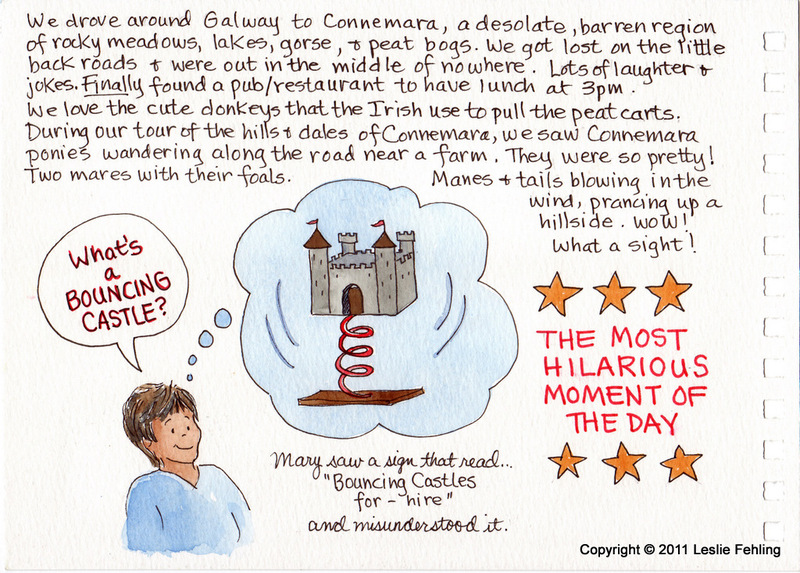 One of our traveling companions, Mary, saw a sign along the road that said "Bouncing Castles for Hire," referring to the inflatable jumping rooms that you can rent for children's parties. 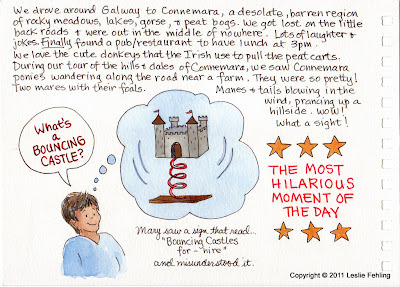 Since we had visited real castles several times that week, she, of course, had them on her mind. When she innocently asked our driver "What's a bouncing castle? ", I piped up and explained to her what the sign referred to. There was a slight pause, then her daughter said, "Mom ...what did you think it was?!" 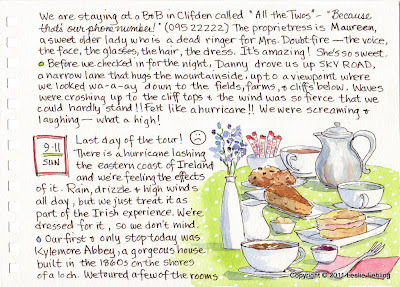 We all started giggling, while poor Mary stammered and turned red in the face. The more we thought about it, the funnier it seemed to us. Maybe we were all giddy from too many hours in car, but we laughed so much we nearly cried at the silliness of it all. Maybe you just had to be there, but it was funny! The rest of the evening, as I was drawing this sketch, I still got the giggles whenever I thought of Mary's innocent question and the hilarity that had ensued. On our last day together as a group, we visited Kylemore Abbey in Connemara. It was a cold, rainy day, but we decided to visit the famous walled garden after touring the abbey. 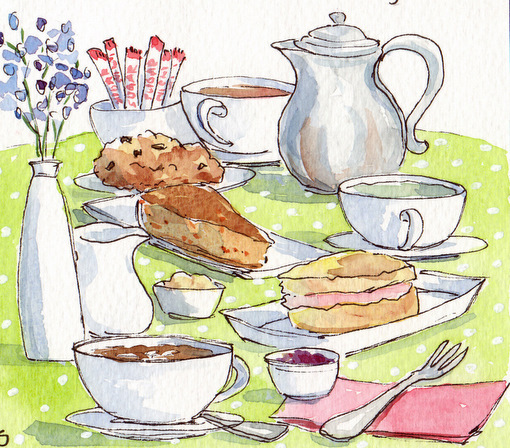 Walking around in the rain had us chilled to the bone, so we stopped at the tea room to warm up. Just looking at this sketch of the table scene from that day makes me feel warm and cozy all over again. It was a bittersweet moment for the four of us, because we were about to go our separate ways. 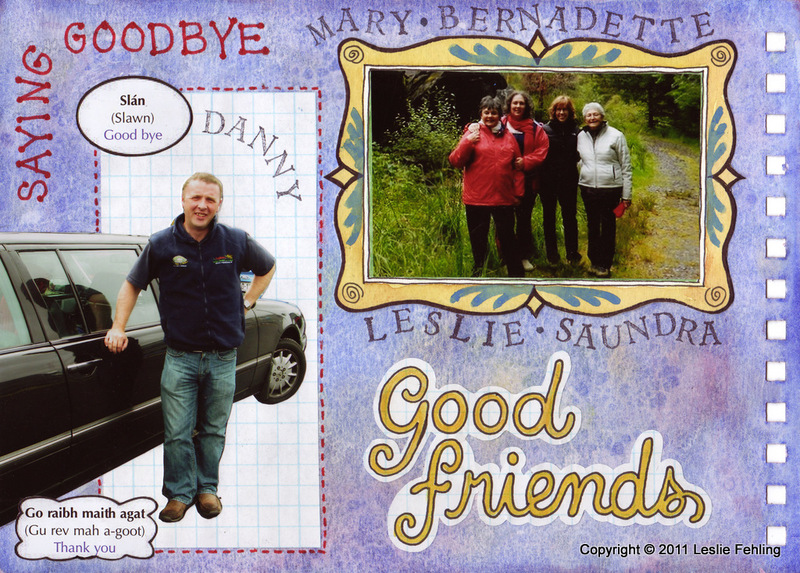 Our friends would be heading back to Dublin to fly home, while my mom and I were remaining on the west coast for a few more days. 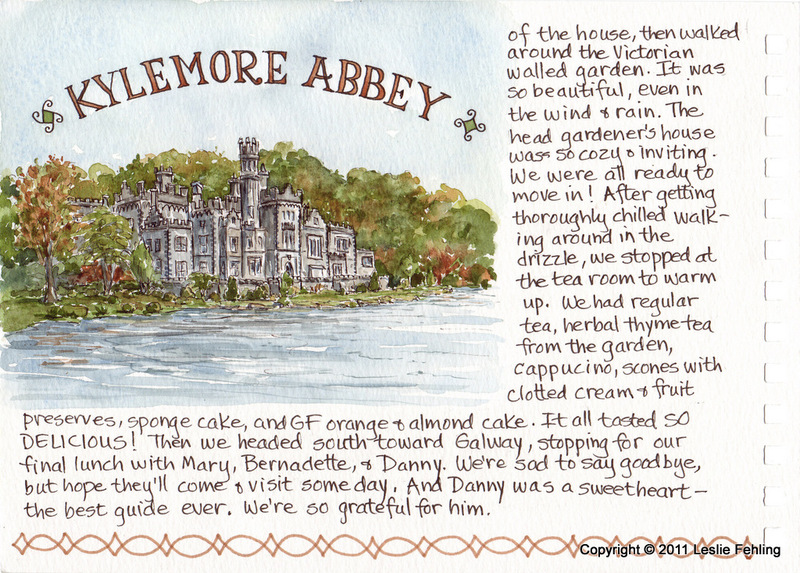 We sat there together, enjoying delicious homemade pastries (even gluten free almond cake!) 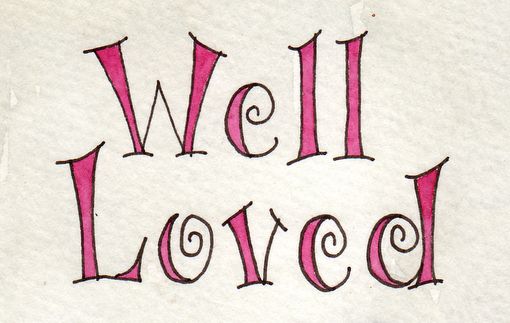 while sipping fragrant herbal teas and cappuccino, making plans to meet again someday. 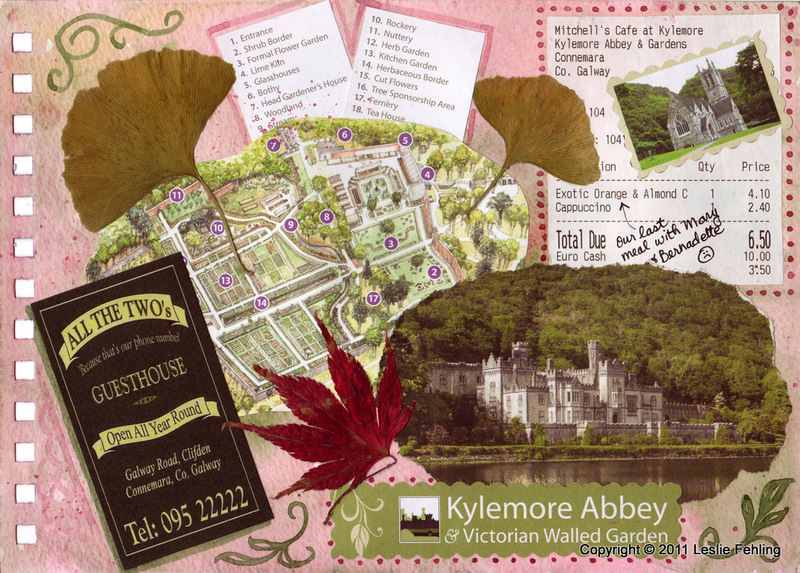 This sketch of Kylemore was, by necessity, done after I returned home. There was just too much wind and rain the day we were there for me to pull out my sketchbook. Working on it weeks after our visit gave me a chance to enjoy it all over again. 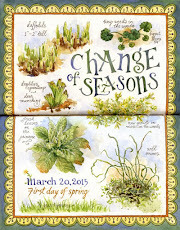 Only two more days of sketchbook posts to come - don't miss them!